The day we have all been waiting for. It’s like Christmas for grown-ups! 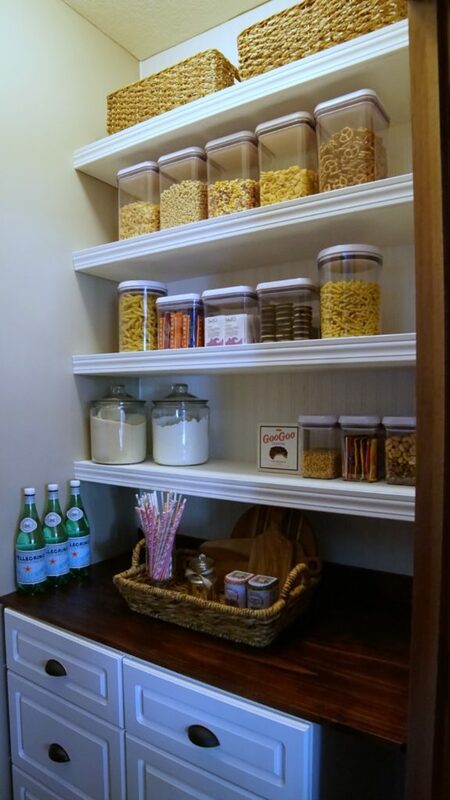 I am so excited to finally reveal our pantry as part of the One Room Challenge hosted by Linda @ Calling it Home. We transformed our old builder-grade-wire-shelved pantry into something both beautiful and functional for our family. Go see all the beautiful reveals that took part in this challenge. It is amazing how many beautiful spaces are gathered all in one place. If you are new here…thank you for stopping by. My name is Tammy and Hey Fitzy is my happy place. As a mother of four crazy kids, I cherish everything home. 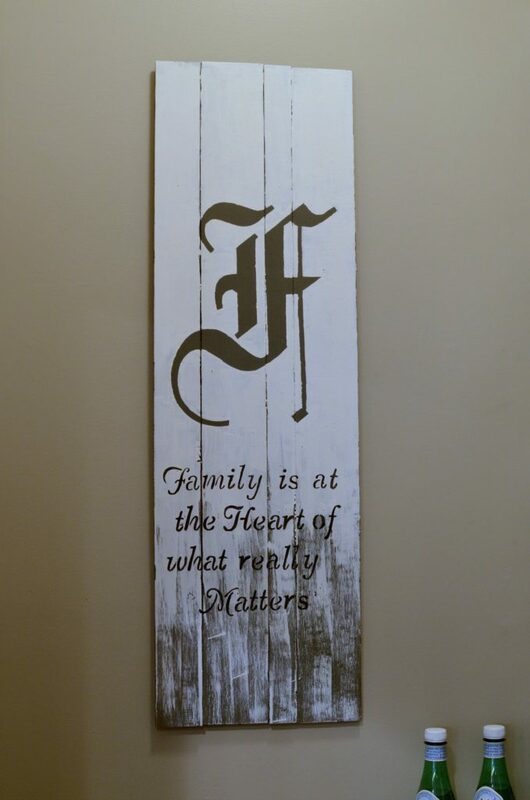 From creating a beautiful and family friendly space to sharing a great recipe with friends, Hey Fitzy journals my crazy ideas as we work to turn chaos into comfort. 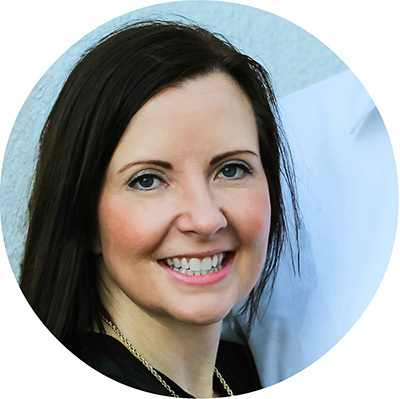 Check out my About Me page if you want to learn more. 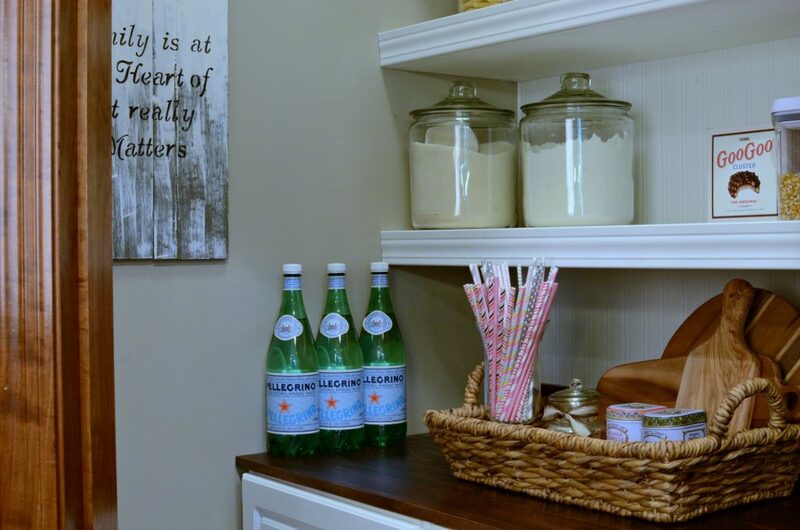 Drum roll please for our pantry reveal! We agonized over so many tiny details to ensure we packed the most usable space into this pantry and are delighted with the outcome! Preparing meals and school lunch just got a whole lot easier. It is amazing what happens when the pantry space is organized with everything easy to see and easy to find. Baskets on the top shelve are used to hide all the little odds and ends that don’t get used very often. I found the glass containers at Target a while back. 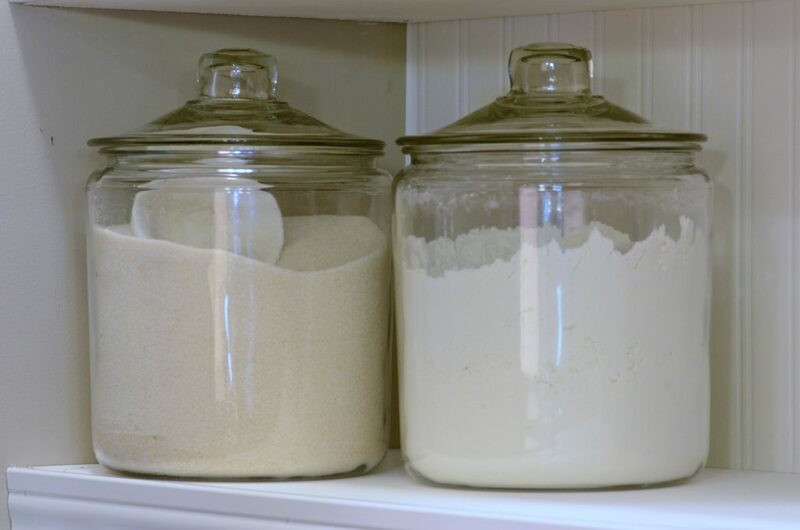 Great way to store sugar and flour. The resealable containers were a Homegoods find. 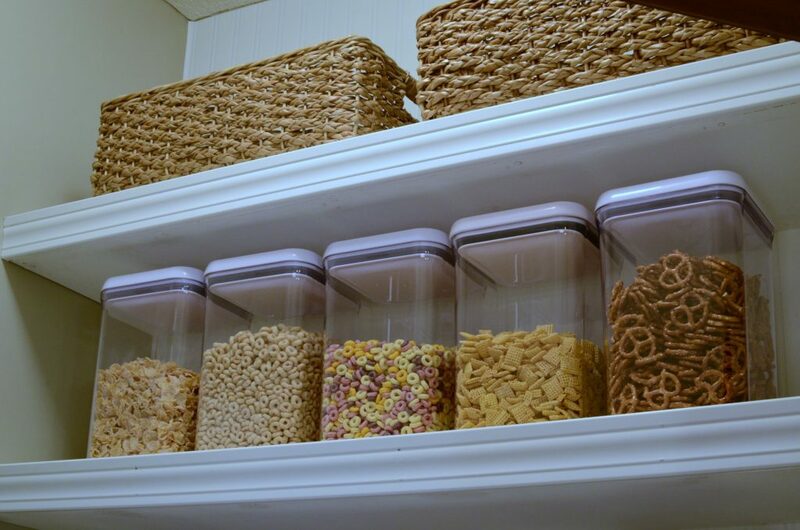 No longer will items get lost in the back of the pantry and forgotten about until after the expiration date. I am so excited to have a small counter space that can be used for food prep and /or serving! 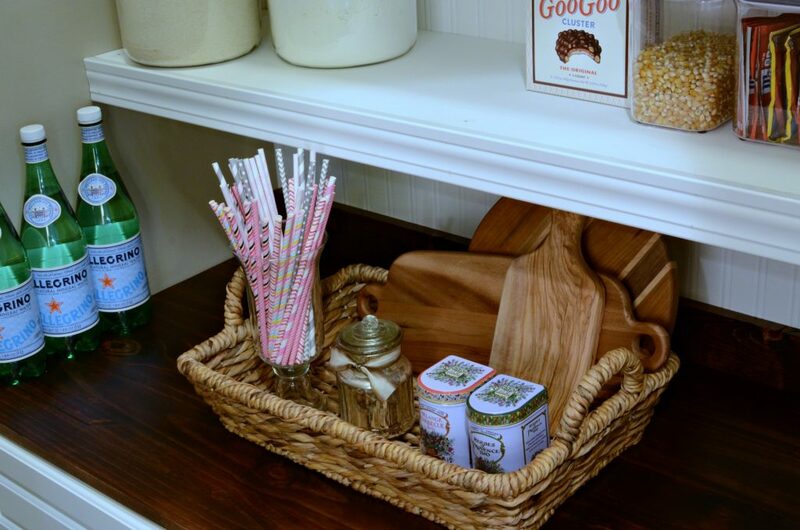 This cute little basket was a Target find and is perfect for organizing the counter space. 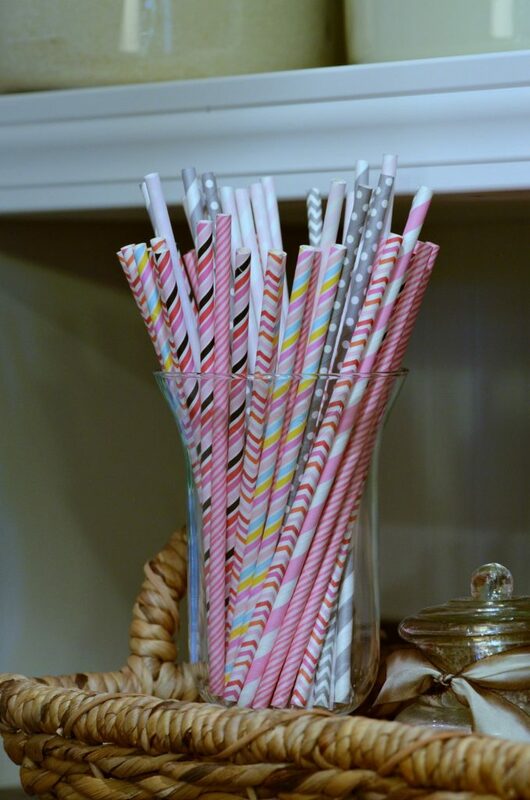 My kids are enthralled with paper straws right now. Such a fun way to spice up the average cup of milk or juice. Ok folks!!! I have to share my absolute favorite part of the One Room Challenge. As you all know last weekend was Mother’s Day. Fortunately for me, my son (that is stationed overseas) just happens to be home on leave (Insert happy momma face!). Well…he spent several days creating this secret project for me. He came up with the idea, shopped for materials, and spent hours making it all by himself. Can you imagine my delight when it was presented to me!!! Homemade gifts are always my favorite and this is certainly one I will treasure for a lifetime! The drawers have to be the best part of transforming this pantry into something functional. Each drawer is used to provide a designated space for specific groups of food; breads, school snacks, baking, canned goods, etc. No longer are items simply shoved on a shelf to be lost amongst the chaos. Now everything has its place and is easy to find. It is so exciting to see how far this space has changed over the last six weeks. From the scary before to the delightful after, this space has certainly been transformed! 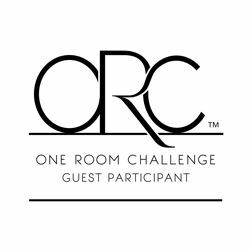 Last fall I had the opportunity to participate in the One Room Challenge. You can click here to see how I transformed our builder grade master closet into something both functional and beautiful! This week I am also linking up Thoughts of Home on Thursday! Thank you Stacy! We don't get to see our son very often so it is truly a treat!! P.S. Your pantry turned out beautifully!!! I love looking at other people pantrys. It's just nice to see how others deal with the storage needs! Nicely done. Thank you! Updating a pantry is truly a game changer in our home. Creating meals and school lunches just got a whole lot easier!! It looks awesome! You did a great job, and kudos to your son for such a lovely handmade gift! Thank you Nicki!!! I still can't believe my son made that beautiful sign for me. What a sweetheart!! 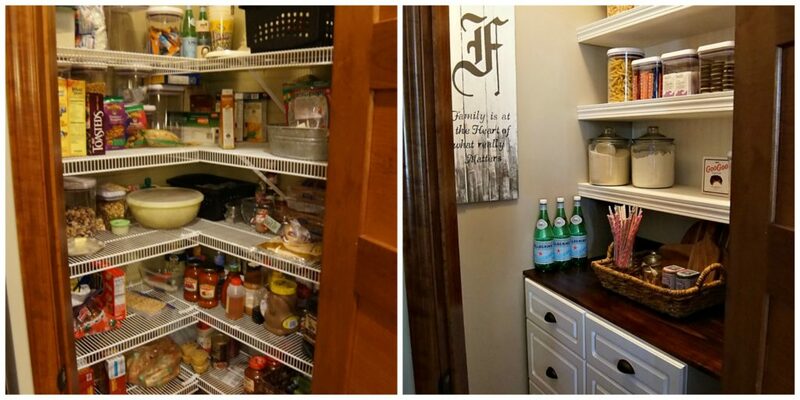 What a great make over for your pantry! I'm going to pin it so I can remember this idea! Thank you Deanna! The pantry has been on our to-do list for a very long time. Simply delighted to have a new user friendly pantry!! Wow! I am more than a little jealous - it's so pretty! Great work! And that's such a sweet gift from your son. Love it all! Thank you Lizzie!!! I am so excited to have completed the One Room Challenge. P.S. Love your kiddos new space. It looks amazing!!! Your pantry is beautiful! That little countertop is genius. It makes me wish I had thought of that when we had our pantry built in last summer. And what a sweet story about your son. So many reasons to smile when you enter that space from now on. Job well done! Thank you Leslie!!! It is amazing how exciting a new pantry can be. The whole house is delighted to use the new space. P.S. Enjoy your beautiful new patio space this summer. It looks amazing!!! It's just amazing! So organized and functional and pretty! Even your Oreos are organized. And the sign just makes it perfect. Love your blog. Just subscribed!! What a great space Tammy! It's also so neat and organized and visible! Want to come over and give my pantry a makeover? ;) Love it! Thank you Tricia! I will grab a bottle of wine and be right over!!!! You did it! Your pantry looks amazing and so close to the inspiration picture you had. It's funny to say that a pantry is pretty but yours is. :) Happy Thoughts of Home! Thank you Stacey! Our pantry is quickly becoming one of my favorite spaces in our home!!! Thank you Elise! It is amazing how much clear containers are a game changer! You will love them!!!! 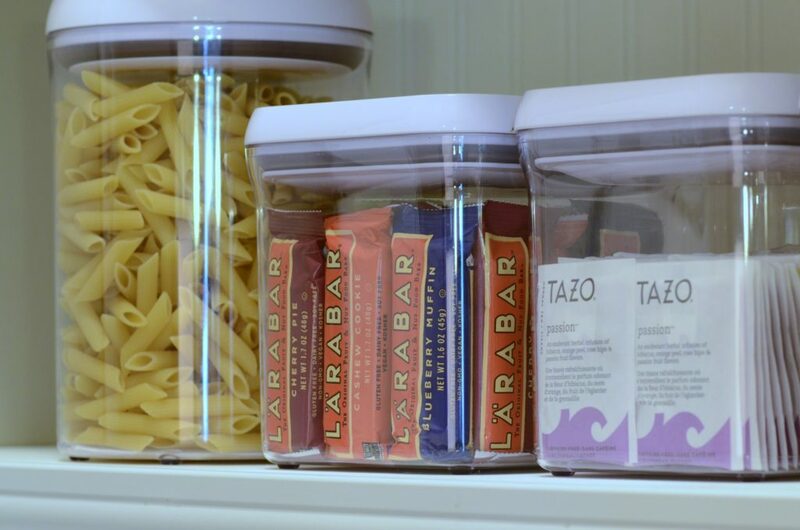 Loving how your pantry turned out. It looks wonderful, I bet it is really going to make finding food and putting items away a treat instead of a chore. I envy your pantry Tammy! So clean, organized, and pretty! Congrats and CHEERS to us for another room done! Thank you Vel! 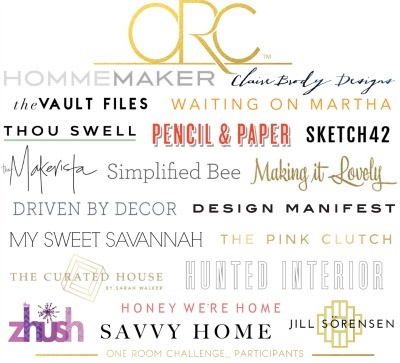 The One Room Challenge is such a great opportunity to get motivated for a room update. Love your Star Wars room by the way!!! Thank you Lorraine! I am so delighted with how the pantry turned out!!! Oh it's SO good! Totally worth the wait. You must tell me about those pretty tins in the basket tray. Thank you so much for linking up to Thoughts of Home on Thursday. You make our gathering a happier place. Hi Laura, Wow...you have an amazing eye for details. :) Those pretty tins were a gift from our French Foreign Exchange Student. She stayed with us the last two summers and knows I love to cook. She brought me French herbs that came in those beautiful tins. They are so lovely and the herbs are amazing!!! Thank you for hosting at Thoughts of Home on Thursdays!!! I know I already said it in a previous comment during the past weeks but I really wish I could have a pantry!!! I never thought of this before but when I saw your project I just start dreaming of pantry... So organised and stylish... I love it! Well done! Thank you Nadia!! Without a designated pantry, I wonder if you have a little corner where you could build something similar. I truly can't believe how much stuff I can organize into this small space. P.S. your nursery is just darling!!! Great job! I love the drawer space and the detail on the shelf edges! And how amazing that your son created the art for you, what a sweet surprise! Thank you Melissa!!! I smile each time I think of all the loving thought that went into creating that art for me. It makes this momma so happy!!! 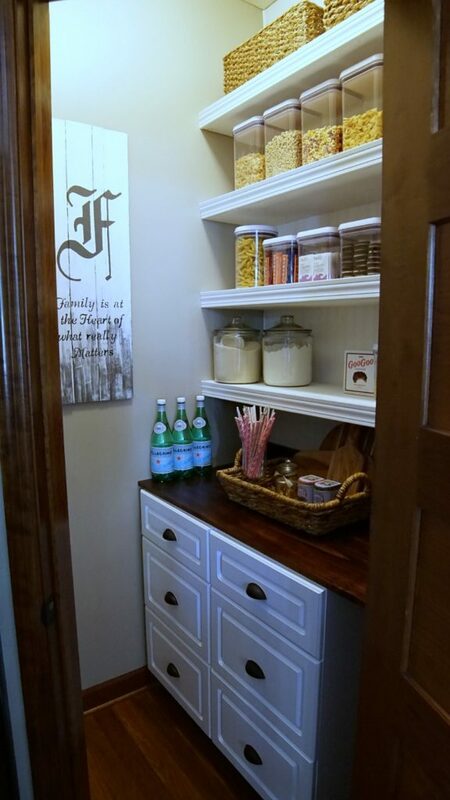 loving this petite butler's pantry. I think you hit it out of the park and I may need you to share some organizational skills with me. Thank you Jessica!! Now if only I can get my kids to keep it this organized. That will be the toughest part of this challenge!! 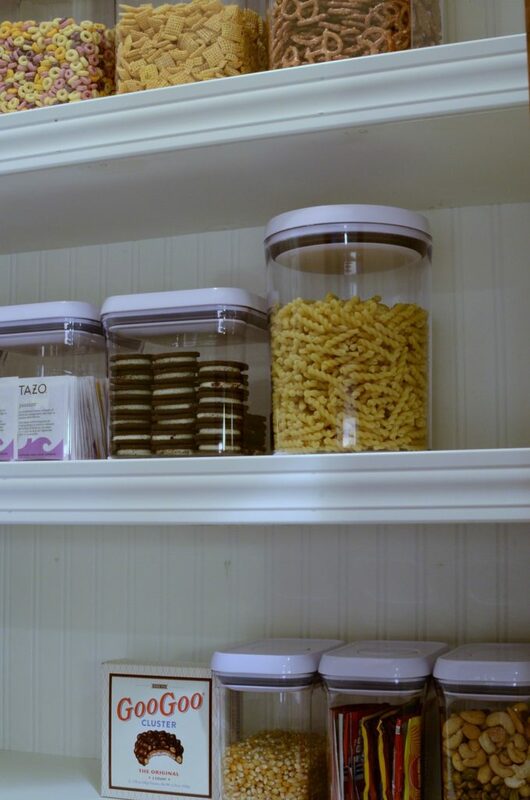 I have serious pantry envy!! I would pull my computer in here and work and hide from everyone!! It looks so pretty! I love how you warmed up the white with the wood! Thank you Amanda!! I love the space so much that I even considered taking the door off. Thought it might be fun to have the space open to the rest of the kitchen. This turned out so great Tammy! So happy for you and your organized pantry! You are going to love it, we still love ours! Thank you Danielle! It is amazing the difference an organized pantry makes. Food prep and school lunches just got a lot easier!!! 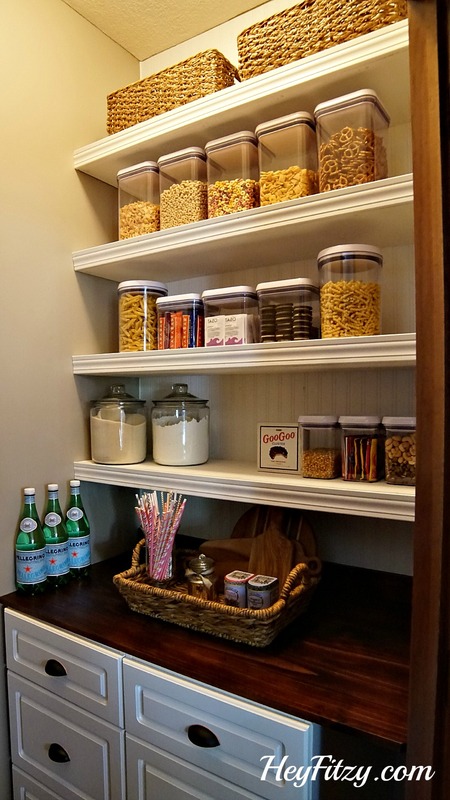 Hi Tammy...I am so jealous that you have a pantry :) I love how organized it is, and how pretty it looks...so easy for the kids to find their snacks. Great job! Tammy! The pantry is incredible! Love the counter idea and the sign your son made... priceless. Congrats on such a beautiful space. Thank you Joy!!! So happy to finish the ORC and have a new pantry space!!! This is amazing! I am so jealous of such a beautiful, organized pantry! Thank you Rachel! Nothing like a home made gift from my kiddos!!! Always my favorite kind of gift!! It's like it's not even the same house! 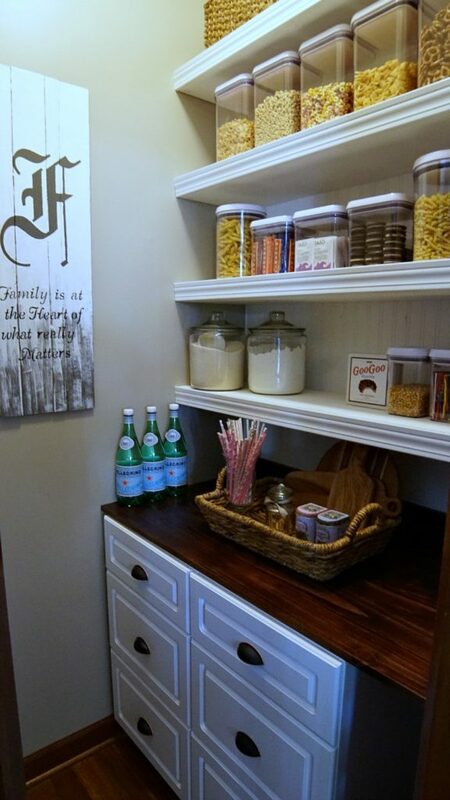 I love it and how you saw the potential in taking a typical, traditional looking pantry to a pretty little space! Thank you Jennifer! My hubby thought I was crazy when I proposed the idea (which isn't unusual by the way). Now everyone in the house loves our new pantry!!! What a great transformation! I love it! I love organized pantries! Yours looks amazing. Love the new shelving, drawers and counter. Beautiful space... and so sweet of your son to add a finishing touch. Hi Erin, Thank you for the kind words. It really is a game changer now that the pantry is organized. I would dread the morning crunch time when making school lunches. Now...school lunches are so much easier!! !